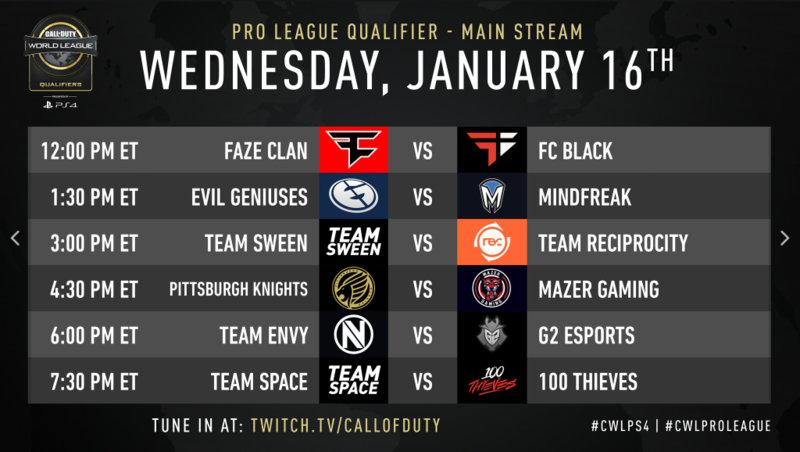 The Pro League Qualifier for the 2019 CWL Pro League takes place from Jan. 16th to Jan. 20th, setting the stage for the rest of the year’s competitions. The Call of Duty World League season started off with a bang in December with CWL Las Vegas. 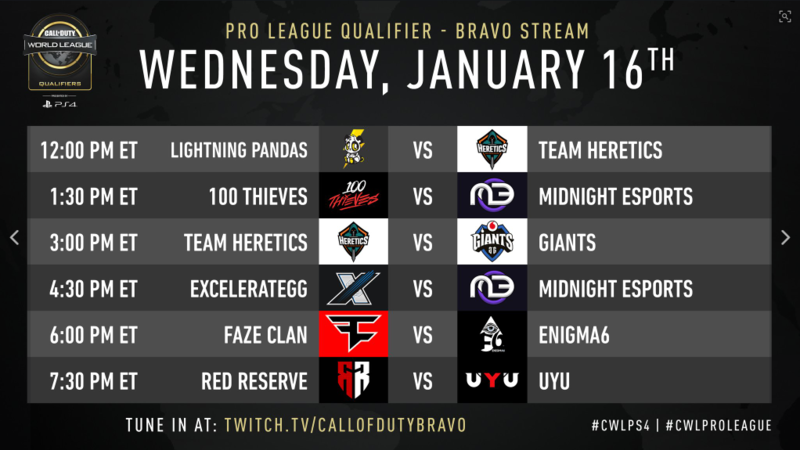 The event served as the first qualifier event for the 2019 CWL Pro League. The top 4 teams from the event have already qualified to play in the Pro League and will not be participating in this week’s qualifier event. These four teams are: Optic Gaming, Eunited, Splyce, and Luminosity Gaming. After the pool play finishes, the Qualifier Playoffs begins directly afterwards. 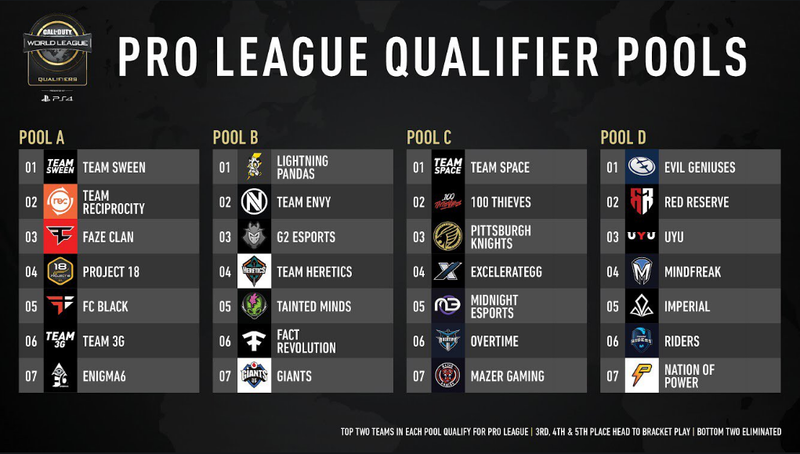 The Playoff format is a double-elimination bracket and the top 4 teams from the Playoffs will take the final spots in the 2019 CWL Pro League. The event goes live on Jan. 16th at 9AM PST/12PM EST and can viewed from Call of Duty’s official twitch channel at twitch.tv/callofduty. 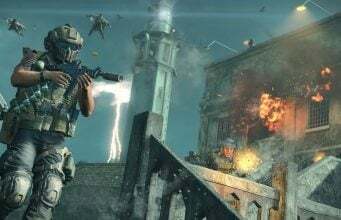 Due to the sheer amount of games being played during the event, games may also be broadcasted from Call of Duty’s Bravo, Charlie, and Delta channels. The games are set to begin at 9AM PST/12PM EST on each day of the event. Wednesday’s schedule is now locked-in. The day starts with the first seasonal episode of Hot Mic at 8:30AM PST/11:30 AM EST. The games begin at the aforementioned times above. The last series of Thursday, Friday, and Saturday will begin at 3PM PST/6PM EST. Sunday’s matches will run a bit later and the last series is due to begin at 6PM PST/9PM EST. As the event unfolds, this article will be updated with each day’s results after the last match of the day. This means updated pools, eliminated teams, and more dependent on the day. Let the games begin! Follow us at @CharlieIntel to stay up-to-date on all Call of Duty news!